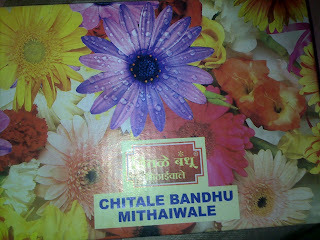 While I was in Pune, I heard a lot about the mango barfi at Chitale Bandhu Mithaiwale. I was told that it is a must-buy item to take back from Pune. I walked to the place, stopping to ask directions on the way to make sure I am on the right path and observing the young, vibrant crowd of college going boys and girls talking animatedly. So now you see that I was directed to this place. Everyone seemed to know where it was. I stepped in and there was a long queue of customers in the mango barfi counter. I bought two packets weighing half a kilo each. Back home, my husband and my son really liked mango barfi. My son totally enjoyed it and knowing how food fussy he is, I was so glad to see his happiness. Perhaps the average Indian's love for food and sweet things comes from a longing to share happiness with loved ones. What's the special food item in your city that you would recommend to those who are visiting your city for the first time? wonderful..next time when v meet v can all taste this also..hehe..spl wishes to hero aditya..
Hey, thanks for stopping by. Sure, I will check soon and share my thoughts on your blog.